This week the Housemates have a Task that they felt was confusing. 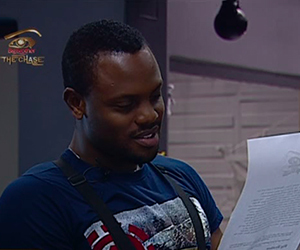 In the Ruby House, HoH Melvin had to read the details of the Task at least three times for his fellow Housemates to understand it. Melvin led the bunch and suggested that they decide on a reasonable Wager. The Rubies settled on 100& Wager yet again, in good faith that their presentation will be a success, like it was last week. The Task: This week’s Task is an inter-house competition between the Diamond, Rubies and Emeralds. Housemates will have to bake, write poetry and do artwork for their presentation. The House that impresses Biggie will win the inter-house Task and their Wager. Biggie is not the only judge this week. In the Diary Room, Melvin reported to Biggie that his team decided to Wager their all in an attempt to win as much back. The overall fear and curiosity is still the mystery of the Emerald House, the tough part being that they are competing against Housemates they don’t even know. This however doesn’t deter the Rubies from motivating each other and keeping their eyes on the prize. Poor Housemates don’t know that Biggie is pulling yet another trick on them by letting them think there’s a third House. Keep the spirit Chasers, this is just the beginning.